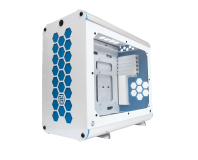 Hex Gear, the UK company behind the R40 case that's currently making waves in the modding scene, will be giving away the first retail sample. To enter the raffle for the give away, all you have to do is purchase something else from the store, including a Hex Gear-branded mug or T Shirt, by 20th March 2015. The raffle winner will then be picked from a list of orders and will receive the R40 case, which will be the first the company receives back from manufacturing. The R40 case itself is due to go on sale this year and Hex Gear told us that it should cost less than £200. 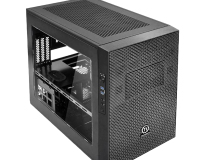 It features an aluminium chassis that supports up to micro-ATX size motherboards, plus two 3.5in and three 2.5in drives. 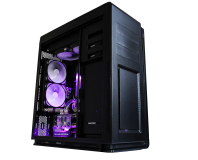 The case has a total of six 120mm fan mounts with three of these in the top where you can also mount a triple 120mm-fan radiator. Hex Gear is also offering accent packs - coloured inserts to customise the colour of the front and rear panels. You can order an item on the Hex Gear website to be in with a chance of winning the first sample and the case will also be available from the website once it takes stock of the first retail units.